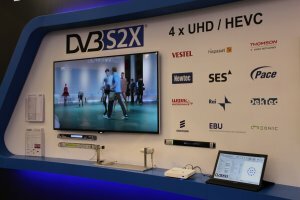 Kaiserslautern, Germany, Sept. 11 2014 – Creonic GmbH, member of the DVB project, exhibits the world’s first off-the-shelf IP cores for the new DVB-S2X standard in a live demo at the IBC exhibition from 12th to 16th of September in Amsterdam, the Netherlands. The live demo is shown on the DVB booth (Hall 1, Stand 1.D81) and comprises Creonic’s DVB-S2X demodulator including timing recovery, synchronization of phase and frequency as well as LDPC and BCH decoder for forward error correction. The IP cores are scalable for coded throughputs of up to 800 Mbit/s and implemented in a Xilinx FPGA. They cover the whole digital signal processing required for data transmission or video broadcasting via DVB-S2X. 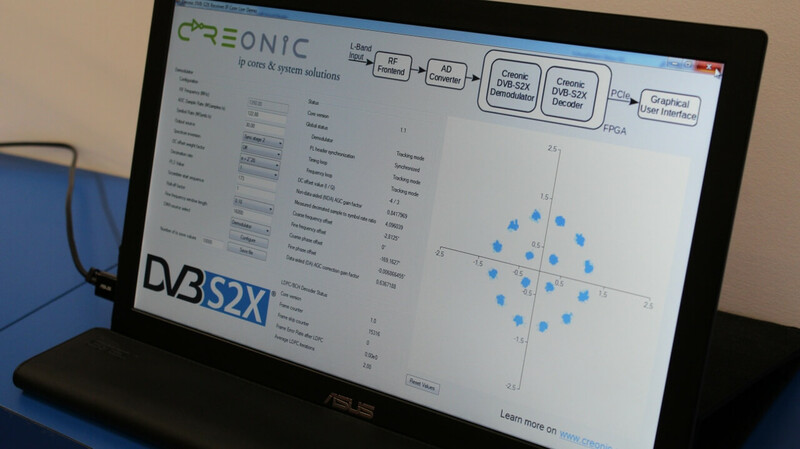 The Creonic DVB-S2X demodulator and decoder IP cores have been built using the company’s proven DVB-S2 cores as a starting point, delivering the highest possible throughput per unit area and forward error correction performance. Both cores are supplied for FPGA and ASIC technologies, as either pre-compiled netlists or as source code. Creonic is an ISO 9001:2008 certified provider of ready-for-use IP cores for communications systems design and for complex signal processing functions such as forward error correction (LDPC and Turbo coding), synchronization, and MIMO. Creonic’s product portfolio covers standards that include DVB-S2, DVB-RCS2, DVB-C2, WiFi, WiGig, and UWB. These cores are applicable for ASIC and FPGA designs. For more information, please visit www.creonic.com.The Creonic DVB-S2X demodulator and decoder IP cores have been built using the company’s proven DVB-S2 cores as a starting point, delivering the highest possible throughput per unit area and forward error correction performance. Both cores are supplied for FPGA and ASIC technologies, as either pre-compiled netlists or as source code.